In June, the world learned of the passing of a great personality in language research. The said personality was not a human researcher but a non-human primate and long-term participant, Koko the gorilla. Over her years of involvement in research, Koko had gained the celebrity status many humans could only aspire to. This speaks to the general fascination for two topics - the cognitive abilities of our primate cousins and the way in which language has evolved. In spite of reporting to the contrary, however, Koko did not "master sign-language". Koko was one of several great apes taking part in projects designed to test the possibility that apes, if taught, could acquire language of a similar complexity to humans. The basic idea was that by testing primates, with whom we share a common ancestor, we would be able to say something about when in our evolutionary history language abilities emerged. The first of these sort of projects took place in the 1930s and 1950s with two female chimps, Gua and Vicki, being raised as part of a human family, and taught spoken language. These two projects failed with the inability of the chimps to produce spoken language, although there was some evidence of understanding. It was suggested at this point that apes would never be able to produce spoken language due to their different vocal anatomy and later projects focussed on teaching a modified version of American Sign Language (ASL). This avoided the problem of speech production and was also thought to overlap with natural gesturing of primates in the wild. Koko started life at the San Francisco zoo in 1971. 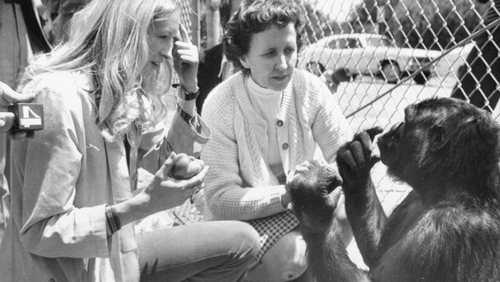 She was originally loaned to Francine (Penny) Patterson to complete her PhD research under the supervision of Karl Pribram, but never returned to the zoo. Following this research she resided at Woodside in California under the care of the Gorilla Foundation until her death. Koko was taught a modified version of ASL and she was also exposed to spoken language. She seemed to learn an impressive number of signs referring to actions, objects, and adjectives (estimated at over 1000). In many ways, however, we learned more about language and great ape abilities from the aspects of language that Koko did not demonstrate or master. The biggest hurdle to acquiring language for non-human primates is the structural aspect we refer to as syntax or grammar i.e. as humans we understand that there are rules about how we combine words. We are also able to deal with sentences that have a complex structure i.e. that are non-linear. Far from being a waste of time, animal language projects have taught us a lot about apes and the properties of our own language. One potential argument for the failure of apes and other primates to deal with this complexity is the memory load involved. However, modified techniques such as using plastic symbols with Sarah the chimpanzee or using a visual display of symbols on a computer screen (lexigram, with Kanzi the Bonobo) did not greatly improve structural understanding. Apart from this obvious difficulty, there were several other indications that apes did not really "get" language. Many of the primates did not use language spontaneously. Even in examples where they did, they used it simply to acquire something such as food or a hug. This is in contrast with young human children who, although they use language to request things, also talk (or sign) simply to interact, to be social and to alert someone to something interesting. Other issues that arose with projects such as Koko were the tendency of experimenters to over-interpret the performance of the given ape and how much of the signing performed by apes involved repetition of signs that the experimenter had just produced. It is now generally accepted that apes and other non-human primates cannot acquire language and that the major stumbling block is structural complexity. Far from being a waste of time, however, animal language projects have taught us a lot about apes and the properties of our own language. Regardless of the outcome of work with Koko, many of us involved in language research would have to admit to being outdone by a gorilla in terms of contribution to the field!